While taking a shower – I mean isn’t that when/where a lot of our thinking occurs? – I was thinking about the intro for this post. And the first word that popped into my head was ‘So’. I feel like a lot of my posts want to start with that word so I’m going to make a conscious effort to avoid it. I mean, the draft of this post started with ‘So’! Anyway, about two weeks ago, my friend took me out to dinner to this Arab Restaurant called Arabian Island located below his apartment building (such a gentleman). It was a good time to do some catching up and discuss our very interesting lives; away from wanting to order cake and devour it alone. The restaurant is called Arabian Island and run by some young lads from Yemen, I was told. 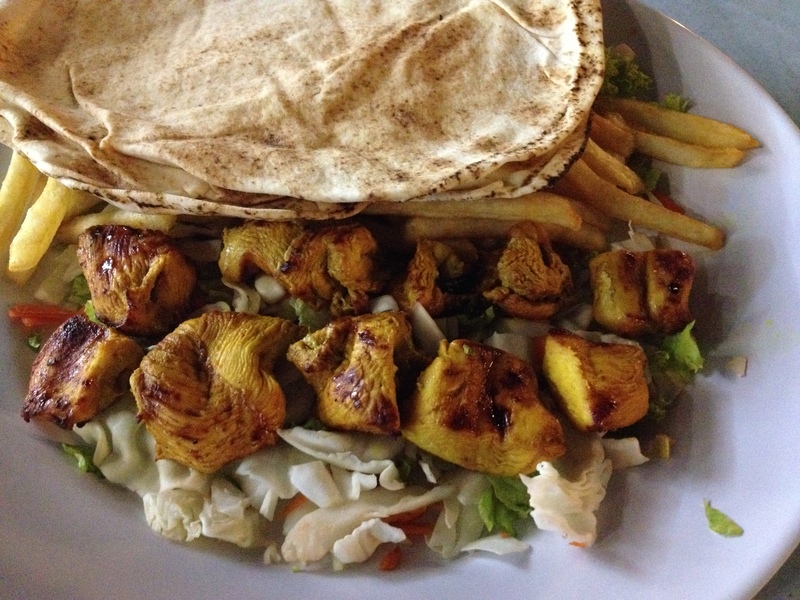 I had the Shish Taouk (or Tawook as I’ve seen it spelled in other menus), my go to Arab meal. It came with lebanese bread, chicken kebabs, french fries, mixed vegetables and garlic sauce. The garlic sauce was good but I thought it was too watery. Also, I’m used to getting Shish Tawook with hummus. The chicken was spiced with curry, lemon, a bunch of other spices and too much salt. It wasn’t as succulent as I’d expected and was a bit dry. The fries were also salty. Typically. I like the way it was presented though. Alhamdu, who paid for dinner, had Lamb Aqda with bread. 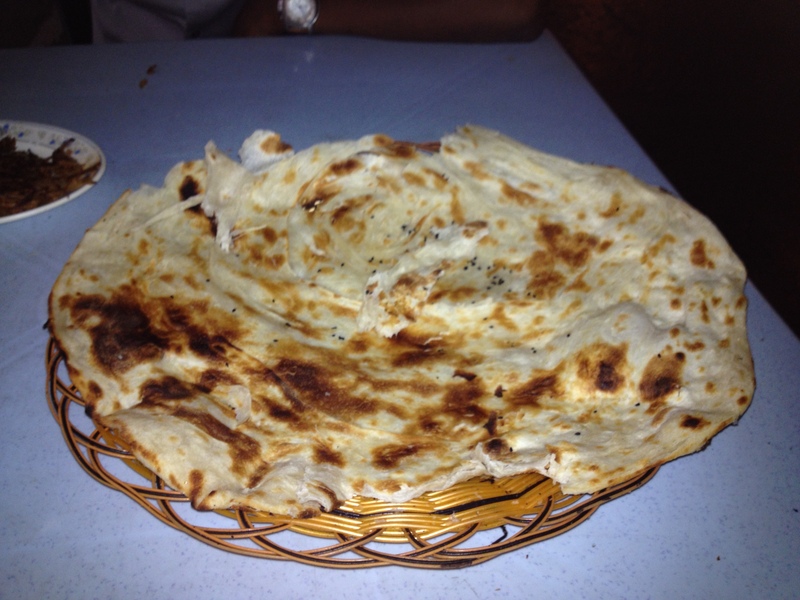 The bread tasted like naan and the Lamb Aqda was too salty but not as salty as the chicken. Alhamdu’s portion was a lot and he had to take the rest of it home. That’s a lot of bread! I like the way it was served. Presentation wise… Probably didn’t help that Mr. Alhamdu started eating it before I had a chance to take a picture. It’s not a fancy place but I think we all want to visually enjoy our food as well. The prices are very reasonable especially as the quantity is a lot. If they could reduce the amount of salt they put in their food, it would be a good substitute for those expensive Arab restaurants. Arabian Island is located at Impian Meridian Condo, USJ 1. The first photo isn’t mine. I’ve been meaning to try hummus but hmmm not sure….. what exactly does it taste like? It depends on what you flavour it with I guess. I like it when it’s flavoured with garlic. You should try it, at least once. Finally someone mentioned the friend they are dining with. This Alhamdu bloke must be someone special. How could any meat-loving person notice salt in meat? Having mentioned expensive Arabian restaurants, I now feel like you owe us a review from one. I have also leant that there is an Arabic alternative for our most beloved Yoruba name, Ope. I certainly will not be darkening Arabian Island’s doorway. I usually eat Shish Taouk in Arab Restautants. If you like wraps you can get a Shawarma. I don’t like lamb so I usually avoid lamb meals. I can stand lamb kebabs though. So I would suggest shawarma, kebabs and fish (I tried a fried/grilled pomfret once). Stick to things that are similar to things you’d normally eat I guess. 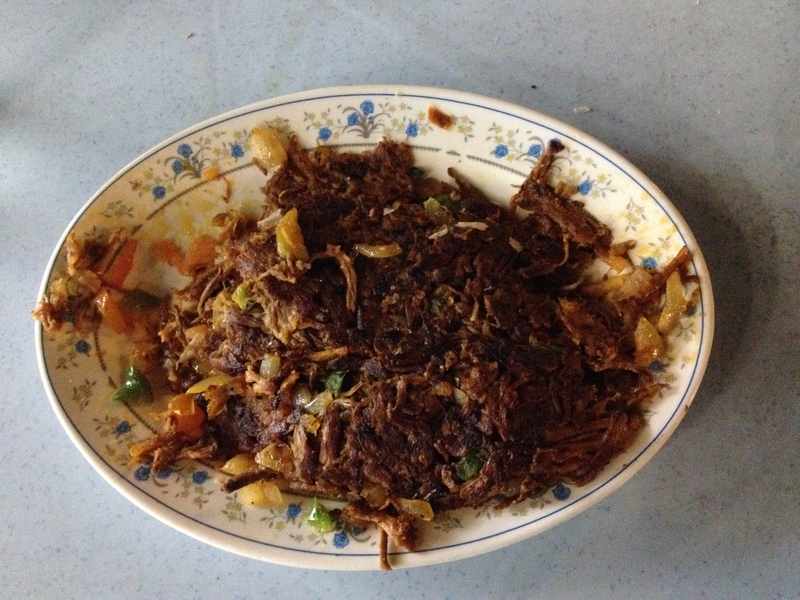 As for my friend’s food, I wouldn’t go as far ‘disgusting’… The presentation was terrible.